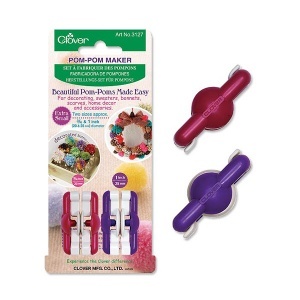 The Clover pom pom makers are amazing little tools for making pom poms - no more fiddling about with bits of card and compasses! All you have to do is follow the straightforward instructions to create your pompom from the wool of your choice, and you will genuinely be finished in minutes! 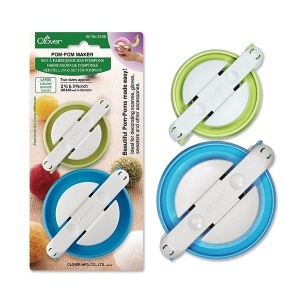 The secret is that the tool has two hinged arches to wrap your wool around, so you don't have to thread it through the hole in the middle - meaning you don't have to guess at the length of wool required, and making it far less awkward to use. We have round pompom makers in sizes from a tiny quarter of an inch all the way up to a giant 4 1/2 inch diameter - imagine a bobble hat with that on! 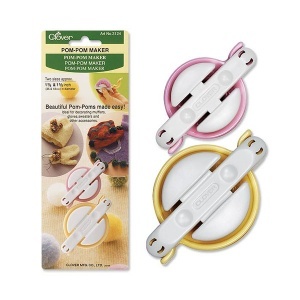 We also stock heart pom pom maker kits for large and small hearts, a cute little variation on the traditional round shape, ideal for embellishing children's accessories. We are a UK shop so all orders will be delivered quickly - order before noon for same day delivery! 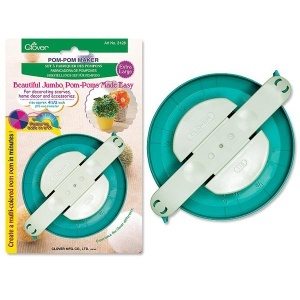 Please click on a clover pom pom maker for more details or to buy.